The origins of Renfrewshire’s oldest golf club date to Saturday 3rd August 1889 when a public meeting was convened in the Ranfurly Hotel to discuss the possibility of forming a golf course in Bridge of Weir. The outcome was that they would form a golf club around land leased in the area of Ranfuly Castle, a 15th century ruin, and William Campbell of Prestwick would lay out the said course to the best advantage. This 9 hole course would be known as Ranfurly Castle Golf Club and the formal opening took place on 2nd November 1889. Sir Archibald Campbell, Bart MP performed the opening ceremony. Willie Fernie of Troon (Open Champion 1883) and Willie Campbell, now of Ranfurly Castle, played an exhibition match. Fernie won 3 & 1 and received a guinea for his efforts. The first member’s competition was played in February 1890. 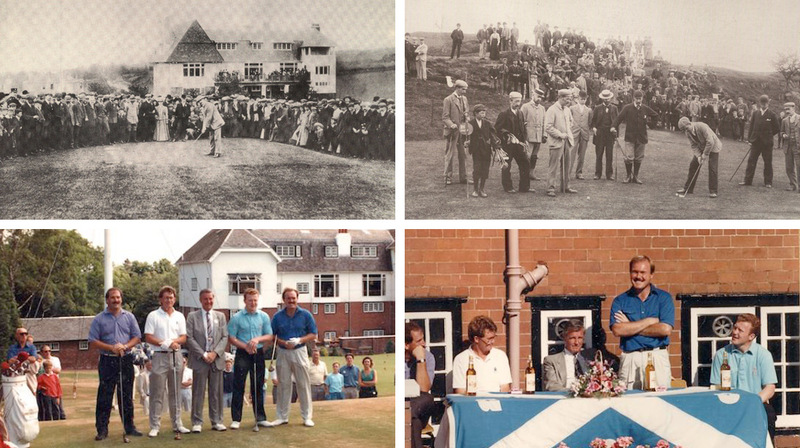 In 1894 the course was upgraded to 18 holes and officially opened in 1895 marked by a professional foursome tournament featuring leading Scots and English players - J H Taylor of Winchester, Alex Herd of Huddersfield, Andrew Kirkaldy and Willie Fernie of Troon. 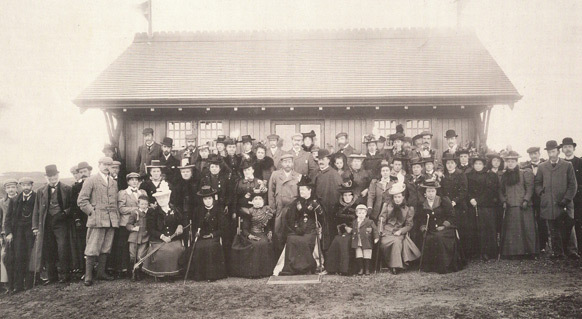 Ranfurly Ladies Golf Club was opened in 1897by Lady Speirs of Elderslie. Ranfurly Castle Golf Club occupied the area now site of the Old Course Ranfurly Golf Club until 1903 when the club was faced with being unable to come to an agreement over the lease of the land, which expired in May 1904. The club found suitable ground to purchase within the farms of Clevans and East Barnbeth and the purchase took place on 21st December 1903 at a cost of £6,500. Andrew Kirkaldy was engaged to layout plans for the new Ranfurly course. A band of eighty men and women along with seventeen horses and carts were employed in gathering stones and clearing the ground of all surface impediments in readiness for the growing of grass seeds. After this thorough scouring the course was in fairly good order by the summer of 1904. John Archibald Campbell won the architects competition to design the clubhouse. His cost estimate was £4,750 however he was instructed to make alterations to bring the cost down to £3,500. The arts and crafts design is reminiscent of the period and recognisable in many of the surrounding properties many of which were also designed by Campbell following his work on the clubhouse. This historic building was B listed in 1988. The course and clubhouse were formally opened on 27th May 1905 by the Captain Mr James Cuthbertson. A professional tournament followed which was won by J.Sherlock of Oxford, with Ted Ray of Ganton GC and Harry Vardon of South Hertfordshire GC second and third respectively. In 1923 James Braid, legendary professional and course designer, was engaged to make recommendations for design changes to the course. Not all of Braid's suggestions were taken up partly due to the purchase of an additional 48 acres of land in 1927. Harry S. Colt, Golf Architect, was asked to come up with a suitable design and proposed two separate designs that were considered along with a third by James F. Robson, Captain 1926 1927. The course as we know it today is the design of James F. Robson with the construction and hole design carried out by Harry S. Colt and finally brought into play in June 1930. Ranfurly Castle has been home to a number of successful amateur golfers over the years. In 1937 A E McLeod recorded a five off the lead performance at The Open qualifying at Carnoustie behind Gene Sarazen, San Snead and Walter Hagen with is 70 over the championship course praised by the Championship winner one Henry Cotton. 1954 witnessed W S McLeod win the Newlands Trophy over Lanark and W S McLeod, K I McLeod and L G Taylor win the East Kilbride team trophy. LG Taylor also won two leading open amateur trophies in the west of Scotland the Edward Trophy and the Tennant Cup.